Metatarsal Supports Protect And Cushion Your Foot. 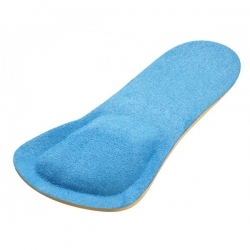 Help relieve pain and increase comfort by protecting and cushioning your ball of foot area. The metatarsal supports are made from PORON which has excellent shock absorbing properties and specially designed to fit into Cosyfeet extra roomy footwear. What's so special about PORON? I've just been diagnosed with Moretons Neuroma and as a keen walker that is a disaster for me. However, since buying these metatarsal supports I've noticed a marked difference in terms of pressure relief. Fantastic I am able to walk freely without pain. thank you.